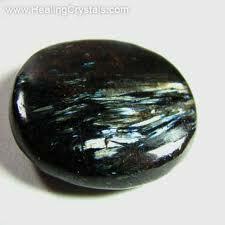 The Oracle at Delphi instructed, “Know thyself,” and this is the essential message of Astrophyllite. I refer to the Book of Stones by Robert Simmons and Naisha Ahsian for most of the following information, and encourage anyone interested to read the full passage on Astrophyllite. Astrophyllite has always been one of my favorite pocket stones – probably because the piece I have is a rounded square: perfect for turning over in my hands, and unintrusive in the back pocket of my jeans. I experienced the power of this stone recently while working to identify the many roles I play in life. There were roles affecting almost all of my chakras – from the Satisfier in my root up to the Protector in my third eye. I needed to accept these roles and release them – even the new role of Wife I had just taken on! Only my crown chakra wasn’t holding any roles – I had a reluctance towards divine connection, and, by the end of the session, I could feel the Light and energy of a Divine Presence flowing through me. In my day-to-day life, I had just been informed that all the bureaucratic hoops had been jumped through, and I was officially a full-time, permanent employee, per the United States Government (I had been operating under a contract as a graduate student for the last year in the library). I was debating if I should commit myself to three years in exchange for student loan repayment – a deal I was not particularly keen on, but hesitant to dismiss. Within a few days of my transition going through, a friend told me he was interested in helping me set up my business as a dowser and healer. That same day – despite prior approval and activation – my government transition came tumbling down like a house of cards. My contract ended in a few days, and it would be weeks before they could post a vacancy and rehire me. It seems the Universe didn’t want me to get too comfortable. I was researching Astrophyllite as this comedy of errors played out, and, much to my co-workers surprise, I didn’t get upset or start to freak out about how I would survive until the paychecks started coming again. It might sound strange, but this unexpected time seems like a gift. I now have an opportunity to knock out a lot of business and finance-related details I hadn’t had time to think about before. I enjoy my day job, however, I have wanted to expand beyond the 9 to 5 grind for awhile now, but had yet to take any sort of leap towards doing so. By looking at the synchronicities of several unrelated events in my life, I recognize the opportunity the Universe presented. I now have the chance (and time) to create the foundation for my future endeavors long after this current governmental mess is resolved and I return to the library. Astrophyllite helped me to see the lemonade I could easily make out of the lemons I was given! While cleaning out what will eventually become my healing room, I came across a book of poetry that belonged to my grandmother. It has been in our family for years, and is full of early American classics: Emerson, Thoreau, Wordsworth, Longfellow – even the Gettysburg Address. Several pages still had Gram’s bookmarks in them, and I opened the first one to this lovely poem. The last line really struck me, because, for as long as I can remember, semantics and a tendency to intellectualize faith has kept me from feeling any sort of connection to the Divine. I became a religion major because I loved reading the texts and learning about many different aspects of people’s beliefs, but never felt comfortable with the Christianity I was raised in (despite Methodist churches in New England being little more than town meetings with coffee and cake after); I just didn’t buy a patriarchal, war-mongering, one-dimensional deity. As of late, I’ve been releasing a lot of the hate and fear towards spiritual belief that had been blocking me from fully accepting my life’s purpose and the interconnectedness of nature, humans, the universe and god… the dreaded “g” word. Some of these patterns did not start with this life, and have been carried through many incarnations, manifesting in different ways: the effects rippling to many whom I came in contact with. I wasn’t even fully aware of my disdain for the very word “god”, let alone “God”, and the overtly righteous tone of monotheism until I looked closer at my own shadows. I feared and hated because I actually yearned for a connection. The perceived absence of a divine presence in my life had created a lonliness that was so buried I was oblivious to the cause. I could intellectualize about everything in the universe being broken down into smaller and smaller building blocks until our very existence simply became energy vibrating at a high frequency, but only recently was I able to take that scientific explanation and add the element of divinity. We are all inherently divine. There is no set of rules handed down from the mountain, sacrifices made in the temple, or other signs of obedience we must fulfil in order for this to be true. It simply is. Accepting this notion that we – all manner of plants, stones, rivers, finned, furry, four-legged, two-legged creatures – are beings of Light and love, connected and infused with the same web of energy, feels far more marvelous than years of cynicism and denial. Everyone must come to this realization in their own time and by their own path – it isn’t a truth that is easily accepted for many, but, by starting small, by working to grow and develop spiritually, emotionally, mentally, and physically, such understanding can be reached. I can safely say, it is well worth the journey. Ralph Waldo Emerson was one of several early American literary figures associated with the cultural movement that was formed in reaction to the rational, intellectualized assumptions about religion (among other reasons). The “spiritual hunger” of New England at that time, along with more widely available non-Western scriptures, opened the door for a fresh perspective on religious truths. Intuition, insight, and inspiration were soon considered gifts from a loving Divinity who gave them to mankind for a purpose, emphasizing the a priori conditions of knowledge regarding the unknowable character of ultimate reality over the empirical and material. Much of Emerson’s poetry follows the principle that natural facts are symbols of spiritual facts, and the mystical unity of God’s love can be found throughout nature. Learn more about Emerson’s “The Rhodora”. who is the protector of the devotees. just as the ripe cucumber easily separates itself from the binding stalk. who emits the excellent fragrance which nourishes all. so may we be freed from Death to dwell in immortality. The Maha Mrityunjaya Mantra, meaning Great Death-Conquering Mantra or Prayer of the Great Victor Over Death, has many names and forms, including the Rudra Mantra, Tryambakam Mantra, Mrita-Sanjivini Mantra, Moksha Mantra, and Markandeya Mantra. Along with the Gayatri Mantra, it is probably the most chanted and highest revered of all the mantras in Hinduism. Addressed to Lord Shiva, it is believed to generate divine vibrations that ward of negative energies and evil forces, creating a powerful protective shield around the chanter, a veritable divine armor which guards against accidents and misfortunes of every kind. It rejuvenates us, pulsating through every cell and molecule in our body, tearing away the veil of ignorance, and igniting a fire within us that consumes negativity, purifying our entire system. Many believe this centuries old mantra can heal diseases declared incurable, and bestows health, long life, peace, prosperity, and contentment. 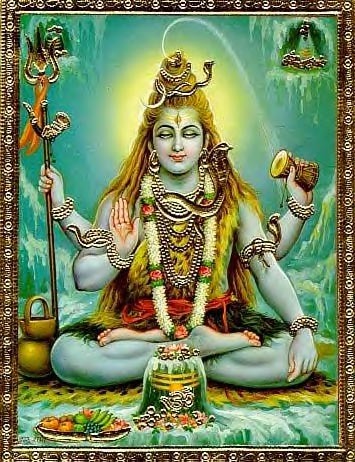 We evoke Shiva within, who removes the fear of death, liberating us from the cycle of death and rebirth and connecting us to our own inner divinity. Depending on which text you read, there are several accounts regarding the origins of this mantra. The Puranas tell the story of a childless sage, Mrikandu, and his wife, Marudvati, who had gained great spiritual knowledge and wisdom. Through their penance and meditation on their desire to have a child, Lord Shiva was pleased and blessed them with a boon, offering them a divine son who would only live sixteen years, or a foolish son who would live one hundred years. Shiva knew their choice, and was not surprised when they chose the divine child, whom they named Markandeya. By the time the boy was eight, he knew all of the holy scriptures and his sagely parents taught him the tools to attain spiritual knowledge, which he performed with great devotion. They did not tell him about the shortness of his life, but, as his sixteenth year approached, their sadness exposed what Lord Shiva had revealed. On the day of his sixteenth birthday, Markandeya took sanctuary in a Shiva temple, and began his meditations opposite a Shiva Lingam. When the messengers of Yama, Lord of Death, arrived to take him away and began to pull the prana out of his body, the boy embraced the holy Lingam and, full of devotion, burst into the Maha Mrityunjaya Mantra. The messengers could not complete their task and returned to their Lord, who went himself to the temple, urging Markandeya to come willingly and follow the natural laws of life and death. The boy tightened his grip around the Shiva Lingam, and surrendered himself to its protection. Yama threw His noose around the nose of the boy to collect him, but threw it too far and it encircled the Lingam as well. Dwelling in the image, Lord Shiva split the Lingam in his rage and appeared, killing Yama with His foot for encroaching on His authority. Although Yama had no jurisdiction to throw the noose over Him, the other Gods implored Lord Shiva to bring Yama back to life, lest the order of the universe be upset by His death. Shiva complied, and then turned to Markandeya and declared, “It is true that your karma decrees you must die by the age of sixteen. However, there are still a few minutes left before you reach your sixteenth birthday, therefore, I stop your aging process at this very moment. You shall not get any older, thus, death may never claim you.” Shiva blessed Markandeya to become the ever-living master of the Himalayas, and a powerful spiritual discipline to promote healing was born. 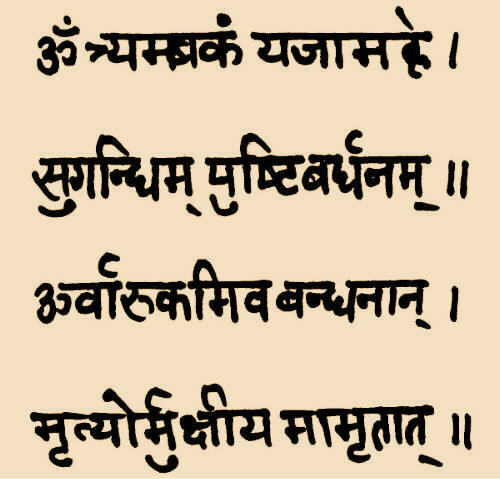 Maha Mrityunjaya Mantra in its original Sanskrit. *There is an urban legend attributing this to the Dalai Lama, however, it is actually a Dutch man named Hein Braat, who is self-taught and performs traditional chants with his own unique character. I find his voice addictive and strikingly beautiful and feel compelled to suggest you buy his CDs because the sound quality is much better and he is an artist deserving of your patronage. **An exact translation of the Vedic mantras is next to impossible, so we rely on the interpretations from spiritual, sacrificial, physiological, and sociological perspectives, provided by venerable Swamis and Yogis over the centuries. Understanding the words is important to make the repetitions meaningful, so here are two word-by-word translations of the Sanskrit. The very first time I met Faith, she asked, “Do you think you’re a healer?” My intuition said, “Yes!” but what came out of my mouth was, “No, um… I don’t know.” I did know, but instead of saying that, my brain decided it wouldn’t be prudent to admit it, and I might sound like a weirdo to this person I had just met. 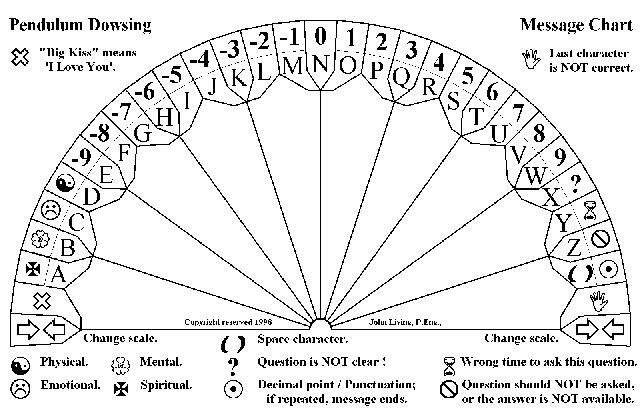 I had a beloved English teacher who used to refer to this as the “Editor Voice”. He used to always tell us, “Just write. Don’t listen to that little voice telling you it’s bad or wrong. Listen to the other voice telling the story and get it onto paper.” This was a case of choosing the right voice. After an amazing wedding and honeymoon, I went to go see Faith again. She had helped me earlier when I wanted to create sacred space for the wedding, and I was positive there was a lot I could learn from her. Drew and I knew we wanted to start a family, and I wasn’t going to sit around waiting to get preggers before making sure all aspects of my being were ready. I wanted to be proactive in my preparation. Unaware of the medical history on my father’s side of the family, I knew the maternal side was plagued with reproductive and other health issues, including vaginal, testicular, and breast cancer, polyps and growths, and multiple sclerosis – and that’s only going back three generations! I wanted to clear the energetic imprints in my family that were causing these ailments, not only for my own health, but for the future health of any children. I want them to inherit their father’s green eyes and their mother’s cheekbones – not her messed up ovaries. Our first session was devoted mainly to the physical – my pelvic bowl (the Seat of the Soul, she calls it) was very tight, and this would need to be able to shift to carry a child with greater ease. Stretching my psoas would assist in loosening that. Posture-wise, for as long as I could remember, my head had always jutted forward, and I could never quite figure out how to stand up straight so that it felt AND looked right. Faith took one look at me and recognized the problem: I was locking my knees. As a result, my entire body was leaning backwards; my head was tipping forward in an attempt to keep me balanced. A few simple steps, and my entire posture changed (bend the knees, balance the weight evenly on my feet, zip up the dive suit, catch the ball and cradle it, open the window, elbows present!). In addition, I had been walking on the outsides of my feet. I have distinct memories of being told I had weak ankles as a child from the way they leaned in. Years of compensating for that perceived weakness had actually weakened me. By focusing on using my entire foot correctly with each step, as well as keeping my body in this new and improved alignment, I immediately noticed a difference. I felt more grounded, more connected with the Earth, and stronger as I walked. I felt almost regal standing up straight with my feet firmly on the ground. Over the next week, my lower back began to frequently pop and adjust, and my pelvic bowl became looser. Never having been very flexible (despite being double jointed), this new mobility in my hips allowed me to finally touch my toes without strain. Amazing! Faith and I decided that the next step was to work with the Medicine Wheel, both to facilitate my own healing, and also to teach me how to assist others in the way she was helping me. My dowsing already gave me a sense of trust in my own intuition, and with some guidance, I could learn to develop my senses further. I wanted to release energetic blocks, as well as old ideas and habits that were no longer serving me and didn’t allow me to fulfill my potential in all aspects of my life. We would begin by working with the South, and the shedding power of the Serpent.